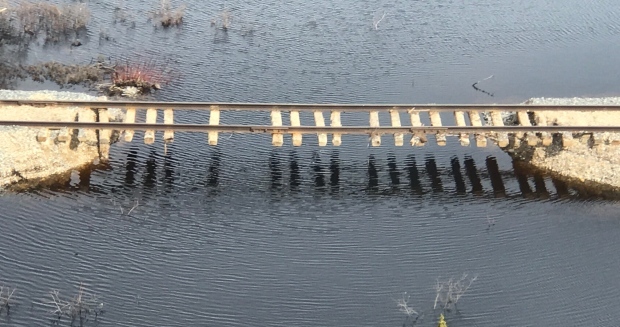 Churchill has been in the news a lot since the rail line was severed near the end of May. Since the Hudson Bay Railway stopped delivering to Churchill, the only way to get goods into the town is by air, which drives transportation costs up. The community is starting to get desperate and prices have increased for groceries, fuel, building supplies and other materials. The federal government implemented its Nutrition North food subsidy program to Churchill and continues to do so. Nutrition North subsidizes "a variety of perishable and nutritious food items" and "traditional food commercially processed". In my opinion, this is a good program to help get fresh goods to people in remote areas. Fortunately for Churchill, it is not the heating season.. yet. There is a big concern about heating for the coming winter season, as Churchill does not have enough on-site storage for propane for the entire winter. The Manitoba government is reportedly "mulling" adding storage. Clearly materials are going to have to come in by ship or barge soon. How Badly Damaged Is It? Two motorcyclists from Colorado drove up the rail line recently and their photos have made quite an impact. Many say the damage doesn't appear to be as bad as Omnitrax has been saying, and there have been a lot of pressure put on the company to start work. The photos clearly show a considerable amount of ballast that was washed away, with several sections of track hanging in the air. There are no photos of the bridges along the line and no photos of culverts or other track support structures. Personally I don't hold a lot of faith with these photographs. It's easy to say that a few loads of ballast will fix things up, but the real costs are with bridges and culverts and there's no way to know from a few cell phone photos how much those are damaged. Dumping ballast may put the line in service for a short while but the next rain storm will break the line again. So far no repairs have been made to the line. Omnitrax says it is waiting for an engineering report to be completed, while people are demanding that repairs start. Local First Nations groups have suggested that the "nearby" shortline Keewatin Railway Company could step in to fix the line. UPDATE: The KRC says they can do it for $2 million and finish in 45 days. Omnitrax has not been communicative, which does not help. Part of the problem with fixing the line is that it has to be done one break at a time. There are no parallel roads or paths that can be used to position materials at each location to be fixed. The repair crew would have to fix one break then move on to the next one. It is possible they could repair it enough to be able to pass over, then leave some equipment and material behind to do a permanent fix as the next break is worked on. I believe Omnitrax plans to do the work in the winter when the ground is frozen and they can move materials over the frozen ground. I also believe that this is too long to wait. At least one person is calling for a road to Churchill. Marolo Alfaro, a professor of civil engineering at the University of Manitoba, worked on a highway in the Northwest Territories. The terrain is challenging - permafrost and muskeg being the primary concerns. A road to Churchill was studied about 10 years ago as part of a Manitoba-Nunavut route, and it was considered "feasible" but no costs were estimated. My guess is that costs would likely be in the half a billion (with a "b") dollar range. Maybe someday in the future a road might be a good idea, but that doesn't help Churchill now. Why Hasn't Anything Been Done? Omnitrax's position is that they are waiting for the engineering study before taking action. The federal government continues to subsidize groceries, as mentioned above. The provincial government has done very little of substance. It is hard to know why no significant action has taken place yet. I imagine there is a lot of discussion behind the scenes, and perhaps something will appear in the next few days or weeks from different levels of government. I believe the major complicating factor is that the line is owned by a private company. I believe the governments are reluctant to give a lot of money to a private company for repairs, especially since Omnitrax really wants to sell the line, and since many people believe Omnitrax has mismanaged the rail line and do not deserve any support. I believe that Omnitrax should sell their line to the local First Nations.. sooner rather than later. They have already signed a Memorandum of Understanding and they should get on with it. Alternately, they should sell it to the federal government. This would allow the federal and provincial governments to step in to assist with repairs and get freight and passengers moving again (and help move that stranded VIA train). Long term, governments have to expect that they will have to subsidize the rail line every year, forever. There can be no reasonable business plan that can expect this line to pay for itself... just like no road to Churchill could pay for itself. The people of Churchill are waiting for action. Manitoba premier Brian Pallister said the province plans to convert about 100 Manitoba Housing units to electric heat to reduce the need for propane heating in Churchill. Mike Spence, the mayor of Churchill, is unimpressed. On July 7 Omnitrax issued a statement that their freight centre in Thompson, Manitoba would be closed indefinitely. Since no traffic is going north, except perhaps a little to Gillam, it didn't make sense to keep the office open. Both the Federal and provincial governments seems to have misplaced priorities when it comes to doing their jobs...they have no foresight or ability to fix this problem which is well within their scope of authority. Time will tell, I guess, Cornergas, but they can't let it tick on for too much longer. ship the VIA roling stock and locomotives out by ships returning from the northern resupply runs . Disgusting. If this were a rail line down here in the Golden Horseshoe it would be repaired in hours but because it is going to a remote community in the North the Government is letting them drag their feet. It's not like Churchill has a lot of options for access. This is the sort of situation the Government should be stepping in and making sure the rail line is open and servicing this community.